Oh no! Scot King of the Internet broke into our studio while we were on vacation and recorded a renegade episode of Kissing Contest. He has some movie news and Pilot Watching with Justice League of America (1997). He even calls up “Big Laptop” himself, Listener Stephen. Check it out before we press charges. It’s the September movie preview plus pilot watching with Young MacGuyver and OF COURSE Border Boss and Fried Chicken Bandits and perhaps a little Pringles Hour too. We are off next week so enjoy this one slowly! It’s a real BLAST FROM THE PAST as PRODUCER FRANK is back from Africa! We talk e-mails, Pilot Watching with The Elvira Show and Lookwell, the thing everyone has been waiting for CHILI DOG SUMMERSLAM, plus the Pringles Hours, Things in movies that vastly differ from IRL and OF COURSE BORDER BOSS and THE FRIED CHICKEN BANDITS RIDE AGAIN!!! Hey we’re still in the NEW ERA so we bring you the premier of BORDER BOSS and THE FRIED CHICKEN BANDITS featuring Scot King of the Internet! Also e-mails, the bestest worstest and weirdest of TV season finales, Pilot Watchin featuring Bates Motel (1987) and Snaxchat thanks to Listener Lois! “ITS A NEW ERA OF KISSING CONTEST! We have a new novelty liquor for guests, we talk about new segments, maybe there will be a brand split, who knows what will happen! Danial gets trolled in Emails, Mike talks for way too long about Suicide Squad, we all talk for way too long about the olympics, Pilot Watching featuring Golden Palace and The Coneheads and what would our ultimate Summer Blockbuster line up be. This is it! We did it! It’s out HUGE 294th episode celebration. We pack SO MUCH into this one! Drinking! Yelling! Singing! Pilot Watching with Poor Devil, congratulatory e-mails, too many rounds of snaxchat to keep track of. What songs were really poppin in August 1986 and what movies were you going to see in 1986? Thank you all for making this dream come true especially for listener Stephen as this was his Make A Wish episode. We hope to bring you 294 more!! Its the August movie preview PLUS snax from Sara Murphy PLUS E-mails PLUS Pilot Watching featuring The Tortellis and Married With Children. 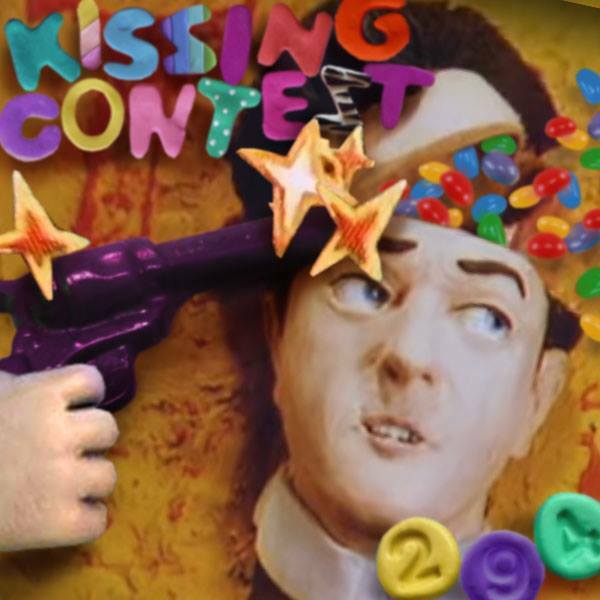 This is the home of Kissing Contest, a comedy podcast about Movies and Tee-Vee made by Sawyer and Mike, two no-longer-young men in Brooklyn, NY, and their young ward/producer, Doan. Often highly misinformed and occasionally inaccurate, but always entertaining.